My special interests within orthopaedics are shoulder, elbow, wrist and hand problems in which I have a long experience having been a Consultant at West Herts NHS Trust in upper limb surgery for 20 years. I see private patients at Spire Hospital, Harpenden, One Hatfield and at St Albans Shoulder Clinic, based at the Elms Consulting Rooms, 24 Hall Place Gardens, St Albans, AL1 3SF. Free on-site parking is available at all of these places. Patients come to see me from Berkhamsted, St Albans, Harpenden, Hemel Hempstead, London and some return from abroad to consult with me following previous treatment. I am consulted for and treat all types of orthopaedic problem (joint pain) of the shoulder, elbow, wrist and hand. I am also consulted for soft tissue problems such as ganglions and lumps and bumps on joints. I really enjoy being consulted by the elderly patient and patients with “wear and tear” problems. The amazing experiences of older patients and their challenging orthopaedic problems make them interesting and rewarding. I treat sports injuries in patients of all ages and I am passionate about sport myself. I see patients – my “weekend warriors” – those who work hard during the week and then love to get out and have a sport-filled weekend. 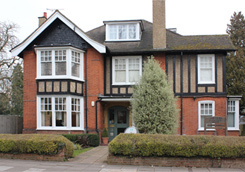 I see patients at Spire Hospital, Harpenden, One Hatfield and St Albans Shoulder Clinic, based at The Elms Consulting Rooms in Hall Place Gardens, St Albans, AL1 3SF. Contact 01727 865057 or e-mail vholland@theelmsconsulting.co.uk for clinic times. I am an approved BUPA premier consultant and have a good relationship with major healthcare insurers.